Join Children of the World for this highly anticipated community event! This will be a magical evening. 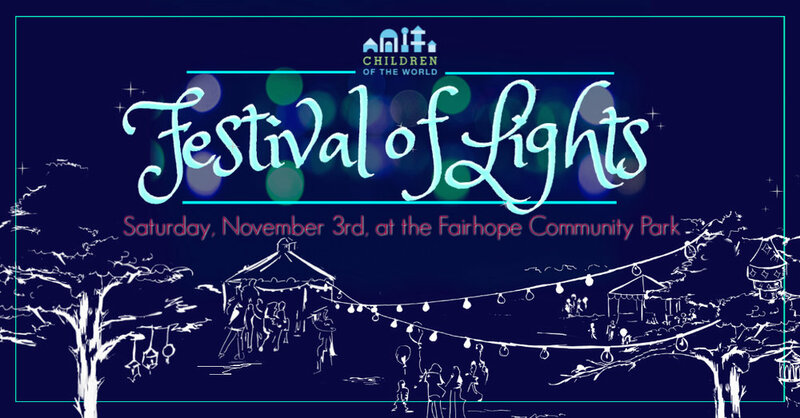 The festival and "community dessert party" start at 5:00pm in the Fairhope Community Park! Family friendly games, activities, and Bollywood music will continue until 7:00pm. No ticket or admission required to attend the festival! Children of the World will provide family activities, entertainment, games, and drinks for the dessert party. Attendees are asked to bring any seating they wish to use (chairs or blankets) and a dessert to share. All are welcome to come and have a blast at this magical family event! Please continue to read below. At the festival, there will be an opportunity to take part in an activity that demonstrates how impactful your "light" is in this world. Specifically, families will be able to see how they impact our community. This will be beautiful and meaningful! We can't wait for you to see! We will have Children's "glow kits" available to purchase for $5.00 each. Kits include: 1 glowing helium balloon, glow stick necklaces & bracelets, and 1 ticket for henna. Individual glowing helium balloons and tickets for henna will also be available for $3.00 each. This year we are adding a little competition! Prize bags will be given for the "best looking" and "best tasting" desserts of the night. Whether you want to bring beautifully decorated cookies or a bag of Oreos - all will be welcome and all will be enjoyed! Don't have time to make or pick up anything? That's fine too! There will be plenty to share. Just come join the fellowship with your community! We had such a blast last year! And plan to have even more fun this year! So, gather your friends & family, enjoy a little Indian culture, and witness how your family's light makes an impact. We hope you plan to join us again this year!